I asked John to help our boys with their bath. This simple request might as well be a death threat to Ethan because he does not like John to give him a bath. He is not as gentle as myself so Ethan becomes a screaming mess when John washes his hair. So, John decided that he would only wash Cameron's hair so he would not have to torture his younger son. As John was lathering the shampoo he said that he thought the new brand was so thick and creamy. As he rubbed Cameron's scalp he noticed the scent was wonderful. As Cameron was under water rinsing his hair John picked up the bottle to see what brand of shampoo I had purchased. It's called, "Crazy Pet Pina Colada Shampoo For Dogs." 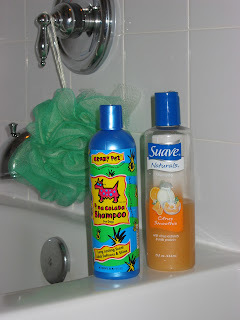 John quickly grabbed the not so thick or wonderfully smelling Suave shampoo and began lathering Cameron's head up again. I guess I forgot to put away the shampoo after bathing the dog. Sounds like a crazy day at the Judd home!Littlest bro.